What SIBS Kids Have to Say! SIBS kids say it is the highlight of their summer! Each year, Oceanside Pre-K/Kindergarten Center organizes a Hop and a Run For SIBS. 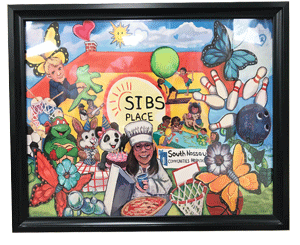 Due to the amazing energies of the children, dedication of administration and staff, and generosity of parents and families - a donation to fund all summer activities is gifted to SIBSPlace. Camp SIBS is opened to registered SIBSPlace participants and priority is given to families who attend our year round program with regularity. Camp SIBS is a six week program during the summer on Tuesdays, Wednesdays and Thursdays. Parents must provide transportation to and from SIBS. We bus the children back and forth to off-site cultural and empowerment activities. SIBS kids say it is the highlight of their summer! For more information, contact Joanna Formont, LMHC 516-374-3000 or email us at sibsplace@snch.org. © 2019 SIBSPlace, Inc. All rights reserved.